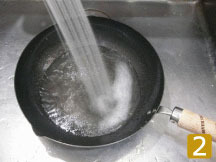 The trick is to add hot water to your frying pan while it is still hot in order to soften the burned food stuck to it. 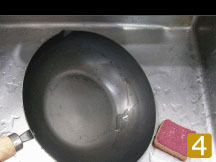 Run lukewarm water over your frying pan while scrubbing it with a brush. As this doesn’t use soap, it’s also better for the environment. 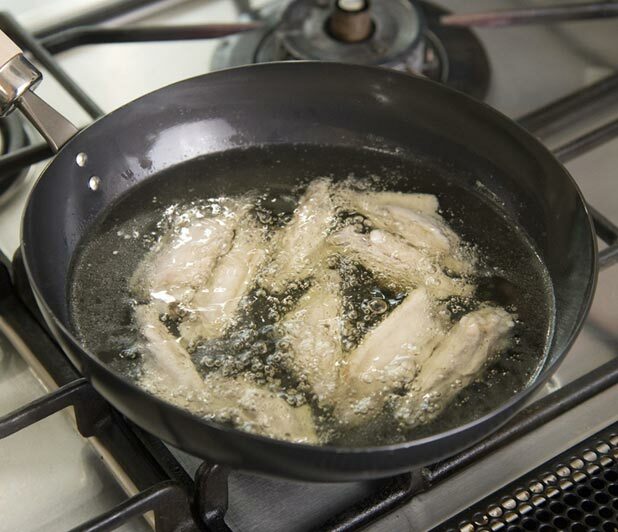 Once the residue is all gone, heat up the frying pan on the stove, then add a single Chinese ladleful of cooking oil and let it coat the frying pan for about 5 minutes. Make sure the heat is set to low at this time. 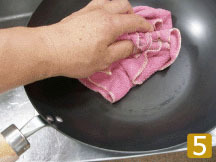 Next, return the oil to its oil pot, use a paper towel or similar material to wipe away excess oil remaining on the frying pan’s surface, and you’re done. There may be times when the frying pan starts to smell of oil after being left out for several days. If that happens, just heat up the frying pan on the stove, then use a paper towel or similar material to wipe away the oil once it has liquidized. Once the oxidized oil has been wiped away, the smell will disappear. These days, when most people think of frying pans, we guess they think of ones treated with resin, such as Teflon, as that is the kind of frying pan many people use. In other words, they rely on convenient frying pans where food doesn't stick. In our current society, where speed is everything, we end up being pressured by time to cook our food as speedily as possible, which leads to the idea that we can cook faster on high heat. 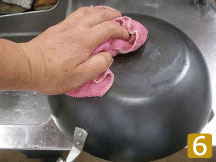 It's no wonder that so many people rely on resin-coated frying pans that, as long as the surface membrane remains intact, prevent food from burning or sticking even on heat that's too strong or with too little oil. 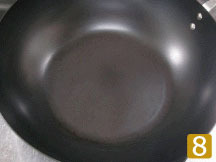 In contrast, iron (steel sheet) frying pans require cooking at ingredient-appropriate temperatures with appropriate amounts of oil, or they will end up burning the food and causing it to stick to the pan. The reason is because when people use iron (steel sheet) frying pans in the same way they use resin-treated frying pans, the greater heat conductivity of the iron (steel sheet), one of this type of frying pan's key features, passes more heat to the food than they intend. Cook on lower heat than usual. Find the right amount of oil needed for your cooking. Follow the manual’s instructions on handling oil. One of iron (steel sheet)’s properties is that its surface absorbs and adapts to the oil every time it is used to cook. 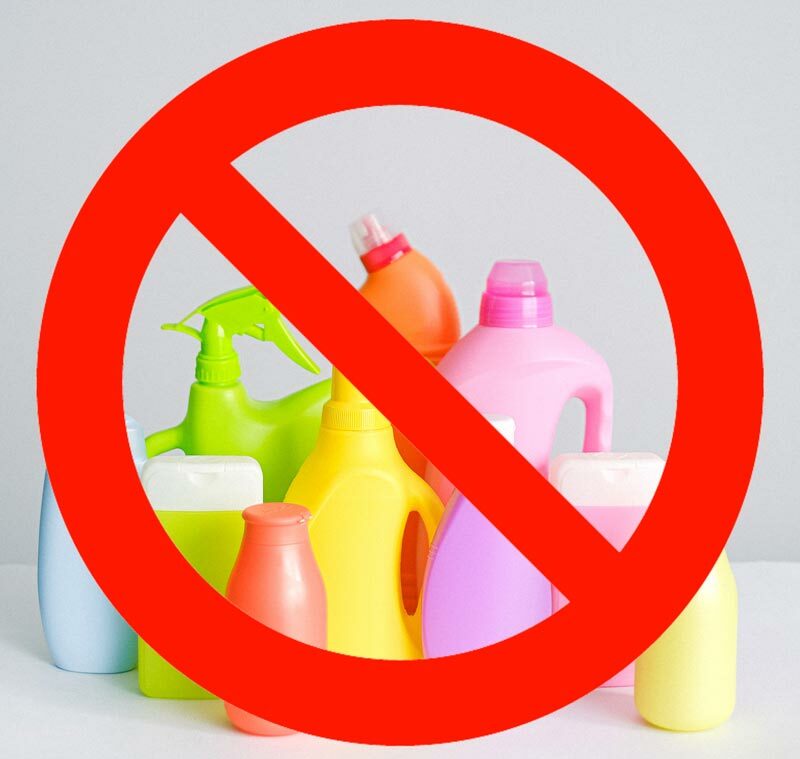 However, many cooks who like to keep a clean kitchen end up using dish soap and/or metal scrubbing brushes to clean their frying pans every time they cook. 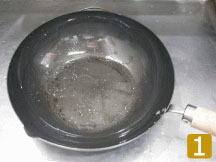 Putting aside the effects this can have on frying pans made of stainless steel and aluminum, when iron (steel sheet) frying pans are washed in this way, it ends up scraping off the oil and ruining one of the best aspects of using iron (steel sheet) frying pans, making them harder to use instead of easier and better for cooking. Simply follow the below instructions and you’re golden. After washing, pour out the water, then heat it on the stove using strong heat until about half the water droplets have evaporated, at which point you can turn the heat off. Once it has cooled off, then you can put it away. Clean it while the pan is still hot. Pour in hot water from a boiler. Use a sponge to wash it thoroughly. There is no need to use soap. Wipe away the water droplets from inside. Wipe the outside off well too. 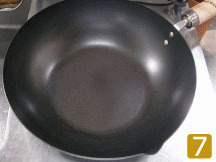 You will be able to tell immediately how important taking care of your frying pan after using it is.